Starting from Pick up from my Accommodation in Hanoi to the Cruise Terminal, The Tour Guide Mr. Lee was the best person very helpful and an amazing personality. Cruise is very nice the Rooms are very spacious with a Jacuzzi in the Room. The beds are very Relaxing. Neat and Clean. The Food served when we reached the cruise starters then the meal everything was very nice. I had the best experience of my life. Thanks everyone!! Unforgettable experience, worth every penny! Great vegetarian/vegan options. Good choice of activities. Room was impeccable. Staff were amazing! Highly recommend Garden Bay Cruise. 10/10. Our Experience: Travelling through South East Asia with my girlfriend, we only had 15 days to spend in Vietnam and after reading articles online about where to go we decided to spend 2 days in Halong. 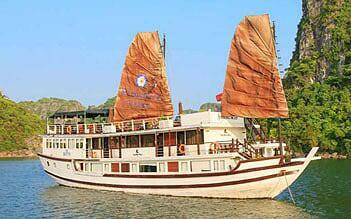 There are many companies and routes to choose when visiting Halong Bay (including Cat Ba and Bai Tu Long). For convenience we decided to book a cruise and chose Garden Bay cruise. Our initial contact with the company was an email conversation with Ms. Rosie Hong, the guest relations manager. She was professional, friendly and responded to all of our questions and queries very quickly. On the day of the cruise we were greeted outside the Harbour by the cruise manager, Mr Cuong. 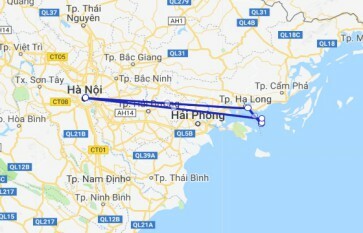 We had booked our own transfer to Halong from Hanoi (although Garden Bay offer their own transfer from your hotel in the old quarter which would have been easier). In our rush to leave the minivan that had brought us to Halong, we had left a bag containing important possessions including a passport and money. Mr Cuong, sensing our panic like a guardian angel, quickly came to our rescue, talking to the transfer company to get our belongings back without further incident. From there, the whole trip was smooth sailing (no pun intended). We were led to the cruise office to check in and greeted to a warm welcome that calmed our panicked selves down immediately. Joining the rest of the passengers (12 in total on our boat with a maximum capacity of 24) we were transferred from the harbour to our cruise ship. Upon boarding, we sat down to a beautiful 6 course lunch with welcome drinks. (My girlfriend is vegan and they prepared her own meals to have alongside the other guests which in her-usually very fussy- opinion was the best food she'd had in Vietnam). During lunch, the tour guide, Mr Quang, briefed the guests on the itinerary of the whole trip while Mr Cuong ran through safety on board the ship. Both men spoke clearly with great English and were light-hearted, funny and professional. The room we had booked was very clean and spacious with a gorgeous view of the sea and surrounding islands. The bathroom was just as nice. Halong Bay itself needs no words (but I'll give my opinion nonetheless). One of the most beautiful natural scenes I have ever seen. Just wow! The first stop on the cruise was Vung Vieng fishing village. An informative but brief history of the village and Vietnam by the delightful tour guide and you're given the option to check it out for yourself for an hour by either kayak or bamboo boat (driven by fishermen/women of the village). We chose to kayak around the area, if you can, bring your waterproof camera and go check it out! A quick detour to a nearby pearl farm was equally interesting and a good opportunity to those more materialistic amongst us to do some shopping. 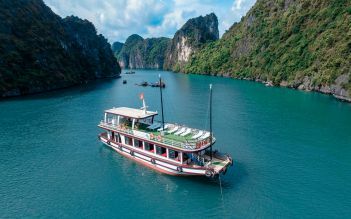 Back to the cruise to dry off/have a shower and then enjoy the beautiful views aboard the cruise before diving into a Vietnamese cooking lesson! They even had vegan ingredients for the vegetarians among us. The BBQ buffet in the evening was just as delicious and luxurious as the lunch (they definitely like to make sure you're full! ), they even included the food made from the cooking class which I thought was a nice touch. The weather was especially nice during our cruise so Mr Cuong arranged the top deck to be our dining spot for the evening. Squid fishing and movies in the dining area were the evening activities offered. We chose instead to relax and watch the sunset with drinks on the top deck which was an experience in itself. The staff were very friendly and helpful, we had a fantastic conversation with Mr Cuong in which he suggested places to eat in Hanoi and our next stops on our journey. He even went so far as to print off a list and talked us through his favourites. I can't begin to express how delighted we were his (and the staff in generals) hospitality. The morning and a few too many drinks later we awoke in our room having missed the Tai Chi lesson led by the captain of the boat. Breakfast served was a light continental of fruits, pastries, meat and eggs. Served with fruice juices, coffee and tea. Perfect to soothe the headache from the night before. A visit to Thien Cung cave was a nice way to spend the morning with Mr Quang acting as both tour guide and photographer, great opportunity for some nice photos together. Lunch on the 2nd day was extraordinary and a chance for the crew to say their goodbyes and then it was time for those of us doing the 2 day 1 night tour to head back to harbour. We opted for the transfer back to the hotel with Garden Bay on the way back, it was smooth and problem free. I'd like to mention especially what happened after the trip. About an hour later after checking into our hotel, Ms. Rosie personally came to visit and make sure our trip went well and asked if we had any suggestions for improvements. This level of attention and genuine want to make their experience better for everyone is something I have never come across. All in all, the level of quality, staff professionalism and desire to go the extra mile in every aspect ontop of the sheer stunning beauty of Halong Bay makes this one unforgettable experience and one you'd be crazy to miss out on. We certainly will remember it forever. 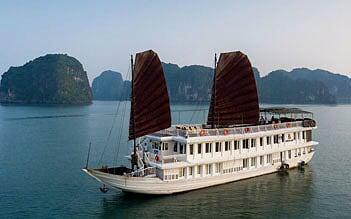 From A to Z, it was a fantastic cruise in the astonishing Halong bay! The best of these two days, including several different and interesting activities, was made thanks to the whole staff and to our perfect guide Kien who was always proactive, paying attention to details and being careful that everyone was at ease and enjoying the excursion. An amazing and excellent experience I highly recommend ! Many thanks, especially to Kien ! We booked a 2 day/1 night trip and had two wonderful days. The cruise was perfectly organized, the food was awesome and the rooms on the ship are very nice and clean. The size of the group on the boat was around 16 people, so it was always very personal. Our guide Quang was great and full of stories and knowledge about Vietnam and we could ask him everything we have always wanted to know and what came across our mind on Vietnam, the culture and the people.